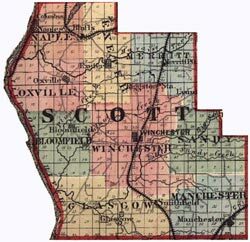 Scott County was established on February 16, 1839 from a portion of Morgan County. It's territory was first part of Illinois County, created by Virginia in 1783. In 1787 this sparsely settled county became part of the Territory Northwest of the Ohio River. In 1790 present day Scott became part of St. Clair County, one of the initial counties in Indiana Territory when it was created in 1800. In 1809, that county became part of the new Illinois Territory and Scott county's territory moved through several county organizations as the population of Illinois began to expand rapidly: first Madison in 1812; next Greene in 1821; and finally becoming part of Morgan in 1823. This very rural county retains much the look it had when your ancestors lived there. Scott County ILTidbits contains 69 pages of data and was last updated 01/24/17. Scott, Adams and Pike County ILTidbits Coordinator: Barbara Saxbury-Freeman.